oratorios of thunder, a descant of rain. Hoepner’s Fourth Panzer Group and Kluge’s Fourth Army are on the move in coordination with Reinhardt’s Third Panzer Group supported by elements of Strauss’s Ninth Army. They roll up the Russian defenders and close their encirclement at Vyazma, trapping four Soviet armies. But the weather changes— the rasputitsa— and the attack slows to a crawl. a stand of white birches. and if you keep on for another km or so, you should be able to see the church. Sometimes you can drive right up to it, but it’s always an easy walk in and out. Twenty-eight German divisions work to reduce the pocket, bleeding off troops needed for von Boch’s faltering assault. Wind, a censer— its perpetual incense. ​ The scents of rain and earth inspire this air like prayers of ghosts. Stalin recalls Zhukov to Moscow. He takes charge of the city’s defense in the nick of time. He makes brilliant adjustments. On October 13, Army Group Center resumes its assault and comes within sight of Moscow on October 16 but can go no further. 2000 sorties by Luftflotte 2 cannot wear down determined Soviet resistance. Guderian, Heinrici and the rest have also met with stiffened opposition in the southern sectors— tanks, fresh infantry divisions, and a recovering air force arm— and Tula holds. Logistical support collapses and Second Army and Second Panzer Group finally halt. In spite of initial successes from Mozhaisk to Volokolamsk, the frontal thrust against the city also fails. On October 31, OKW issues orders to cease offensive operations. Now, just like that, all facts of life topped off with immaculate light. A temporal canon crowds an hour with its grace notes to decay. Senator and Privy Councilor to Catherine the Great. The church was built in 1797.
these banks of wild chamomile. By December 2, for all practical purposes Operation Typhoon is over. Barbarossa has failed and the weakened Wehrmacht assumes defensive postures along the battle line. Plastered brick, white stone, steeply gabled Tuscan porticos, some partly fallen away. On December 5, Zhukov launches his counter-stroke. His attack drives the German army back 150 miles. The Battle of Moscow costs the Reich 174,000 killed, wounded and captured or missing in 14 weeks. Soviet losses are more than 650,000.
but darkness in the corners. artillery pieces and armored vehicles should give you something to think about. you do this, you do that, something happens or it doesn’t. All the old controversies have worn themselves down to nothing. Halder is implicated in von Stauffenberg’s failed coupe d’état and falls from grace. He spends the last weeks of the war in Dachau. During the final collapse of the Third Reich, he is rescued from the SS by Heer troopers. After his rehabilitation and release from Allied custody, Halder helped to de-Nazify and reconstitute the post-war Bundeswehr. He died without fanfare in Bavaria in 1972. Zhukov forces the Germans back, finally encircling Berlin. On behalf of the Soviet Union, he accepts Germany’s unconditional surrender in May 1945. Stalin, fearing his general’s unprecedented popularity, transfers the Victory Marshal to obscure postings far from the limelight. Briefly restored to favor after Stalin’s death, Zhukov quarrels with Khrushchev and is dismissed. In his retirement, Zhukov spent much time fishing—his rod and tackle, gifts from Eisenhower. He died of a stroke in 1974. On the 100th anniversary of his birth, the Orthodox Church conducted the panikhida at his gravesite in the Kremlin Wall Necropolis. Each one’s a testament, a practical gospel. good to keep that in mind. The clear arrangement of everything. so plain and simple nobody gets it wrong. 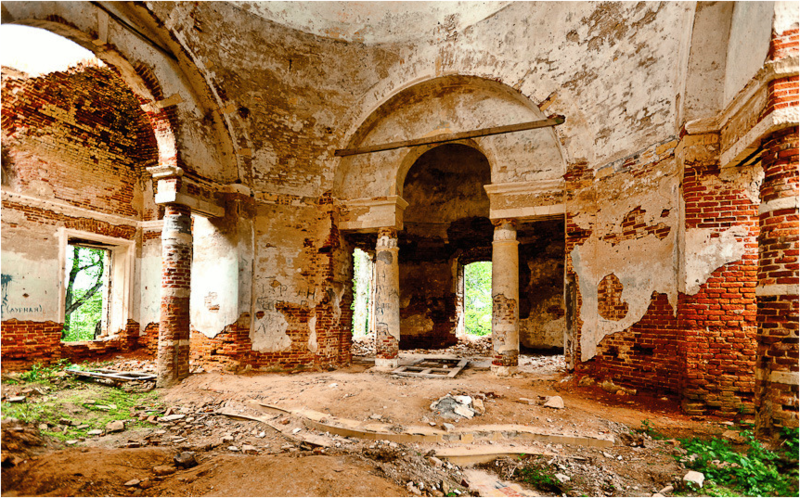 Contemporary Haibun Online published "Revelation: Teplovo Estate" in July, 2015. Modern Haiku published the concluding haiku from “Revelation: Teplovo Estate” under the title “Znamenskaya Church: 7” in Issue 46:1 (2014).